Like most Plextor SSDs, the M9Pe uses Toshiba NAND flash memory. This time it is Toshiba's 64-layer third-generation 3D TLC NAND. This is Toshiba's first mainstream, mass-produced 3D NAND, branded by Toshiba as BiCS 3. The controller in the M9Pe is the same Marvell 88SS1093 "Eldora" used in the preceding M8Pe and M8Se SSDs, so the M9Pe derives almost all of its improvements from the upgraded NAND. 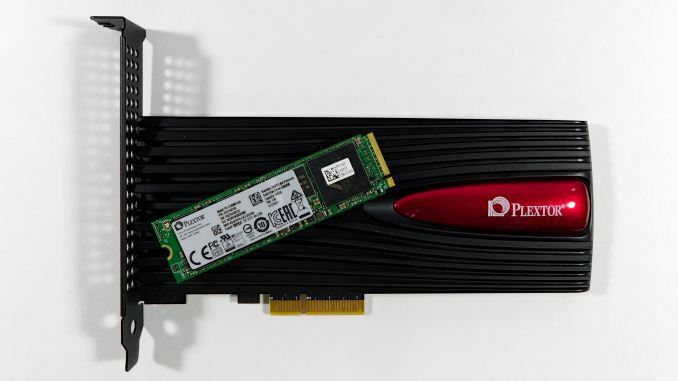 Plextor has managed to implement NVMe 1.3 features for the M9Pe despite using an older controller that was originally designed to target the NVMe 1.1 specification. As with other NVMe SSDs from this generation, the large 256Gbit or 512Gbit capacity of each NAND flash die hurts performance of the smallest drive capacities. The 128GB option is gone from this generation because that would only use half of the controller's eight NAND channels. The 256GB M9Pe still has distinctly lower performance specifications than the larger models, especially for write speeds. Overall, performance specs are a bit below other current high-end NVMe SSDs like the Samsung 970 EVO and Western Digital WD Black. The five year warranty period and ~0.3 drive writes per day endurance rating are typical for this product segment. The M9Pe is SSD is packaged in three different variants. The cheapest M9PeGN is the bare M.2 SSD. The M9PeG adds a heatspreader to the drive that should help a bit with thermal throttling during sustained workloads but may be physically too large to fit in some notebook systems. The M9PeY mounts the M.2 module on a PCIe x4 half-height half-length adapter card with a large heatsink and a row of RGB LEDs. The previous generation M8Pe and M8Se featured red and blue LEDs respectively, so RGB is the obvious way to make the M9PeY even gaudier. The RGB LEDs cannot be controller by the user and instead are managed by the same ITE 8259FN chip we've seen on several motherboards that also feature RGB LEDs. Aside from the lighting, the heatsink of the M9PeY is almost identical to the M8SeY, with a blue plastic insert swapped for red. Since it first hit the shelves, prices on the M9Pe have come down to roughly match other top SSDs when comparing against the M9PeGN variant that lacks a heatsink. The versions with extra cooling carry a substantial premium. Newegg is the only major online retailer selling the M9Pe, and they're not currently listing the 1TB M9PeY add-in card model. Our review samples are the 512GB M9PeGN (M.2) and the 1TB M9PeY (AIC), but we've also swapped the drives in the adapter card to present results for both capacities running as standalone M.2 drives and in the adapter with the heatsink and LEDs. Most of the competition for the M9Pe uses substantially different hardware. The second-generation Western Digital WD Black uses the same BiCS3 3D TLC NAND as the M9Pe but features Western Digital's new in-house controller. The M9Pe shows us what the new WD Black would have been like if WD's new controller hadn't been ready and if they had stuck with the Marvell controller for another generation. The WD Black and the Samsung 970 EVO showcase the strengths of a vertically integrated strategy with the NAND, SSD controller, firmware and drive all designed by the same company. A little lower on the price scale are several competitors based around Silicon Motion's second generation SM2262 controller, a huge improvement over their earlier SM2260 controller. Intel uses the SM2262 in their own 760p SSD, and cheaper drives based on the SM2262 reference design are being sold by ADATA and HP. These drives offer performance close enough to the top SSDs that it's hard to pass up the savings. 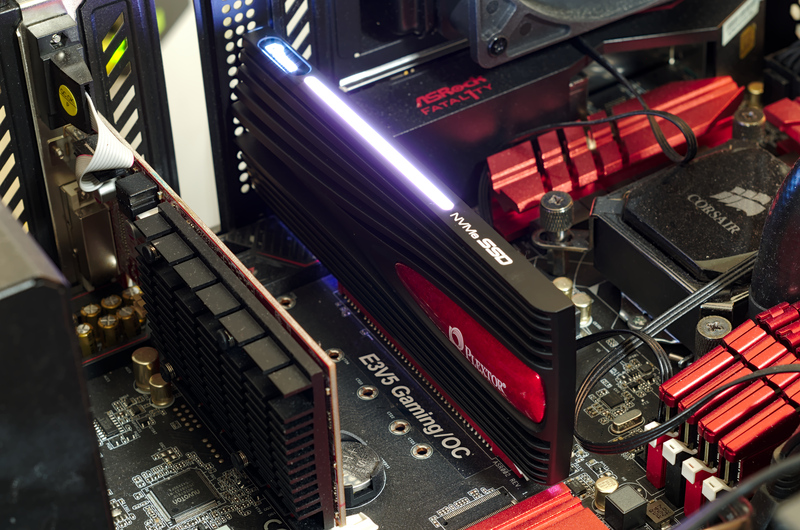 For comparison against other market segments, this review also includes results from the ultra-premium Intel Optane SSD 900P and Samsung 960 PRO, the entry-level NVMe MyDigitalSSD SBX, and the mainstream SATA Crucial MX500. This is our last SSD review using our 2017 SSD test suite. Future reviews will feature benchmark results from a testbed with Meltdown and Spectre patches and microcode updates current as of this month, and a few other tweaks to the test procedure. The Windows 10 version will still be 1709, because Microsoft has not yet fixed all the new bugs introduced in the NVMe driver in Windows 10 version 1803. Regarding the testing platform: "The Windows 10 version will still be 1709, because Microsoft has not yet fixed all the new bugs introduced in the NVMe driver in Windows 10 version 1803." If you're referring to the issues with Intel 600p drives in the April Update (version 1803), Microsoft released a new patch (KB4100403) that "Addresses an issue with power regression on systems with NVMe devices from certain vendors."